New Delhi, July 21 (IANS) Union Environment Minister Harsh Vardhan on Thursday urged people to use bicycle at least once a week to protect the environment. “Use cycle at least once a week, as it will prove beneficial to the environment as well as our health,” the minister said here while leading a plantation drive. 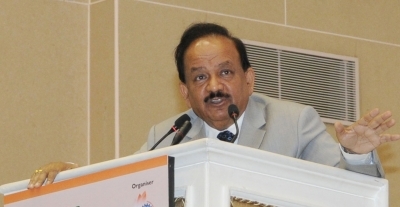 Harsh Vardhan also called upon people to protect and conserve the flora and fauna. Terming planting trees a “divine work”, the Environment Minister said that one should treat them like a family member. “They not only help in making the environment pure but also provide life-giving oxygen, fruits, flowers, shade and cool the environment,” the minister said. “People should plant more and more saplings to stop the imbalance in nature,” he added. Harsh Vardhan pointed out that after becoming the Environment Minister, he had the opportunity to plant saplings at several places in the country, but the pleasure that he got on Thursday in planting saplings while getting drenched in rain was an unparalleled experience.